“It’s never felt more necessary to resist oppression, disrupt the canon, open borders, and breathe air into the echo chambers of bigotry and prejudice,” says Philomena Epps, founder and editor-in-chief of Orlando. Issue 02 centres around the word ‘discourse’. After Issue 0 (the ‘proto’ issue, or, the beginning) and Issue 01 (which looked at the importance of memory and history to establish a progressive future) Epps explains that “discussion, dialogue, and ultimately, creating some form of discourse” was a natural progression. She says, “I see independent publishing as a form of collective action, and discourse as one of the ways to educate, encourage empathy, and open up conversation and critique.” To do so, she allowed the writers and contributors to interpret the brief as they felt necessary, “in order to allow for broad and nuanced responses”. Ahead of Issue 02’s launch tonight at the Bethnal Green Working Men’s Club, we asked Epps to share some spreads from the new issue and gauged her thoughts on the importance of creating our own platforms. Congratulations on a new issue. Can you talk us through some of the highlights? 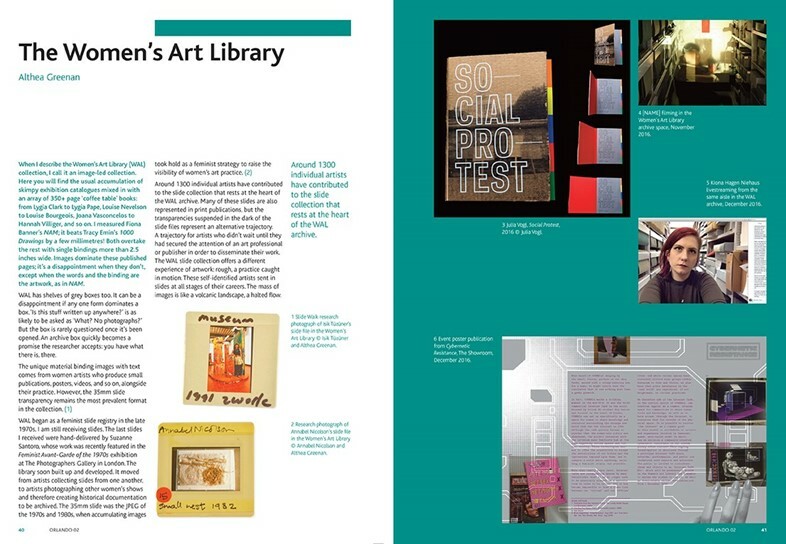 Philomena Epps: Meeting with Althea Greenan, the curator of the Women’s Art Library, and seeing the incredible slide library and collection there was a joy. I really enjoyed creating the image-led piece on archives in Issue 01, and this became a more focused extension of that. I also feel privileged to have three brand new artist commissions from Francesca Blomfield, Keira Greene, and Joy Miessi, and some wonderful previously unpublished poetry from the women in Octavia Poetry Collective. It was important to have as much dialogue as possible in the issue. There are solo authored pieces on precise topics, like Matilda Hemming discussing the queerness of Maggie Nelson’s The Argonauts, but also pages dedicated to the work of collectives, like Bedfellows, or written by colleagues – such as between Lulu Nunn and Tony Heaton from Shape Arts. I love interviews, particularly long-form ones, and it was really interesting to edit and work on conversation pieces. They are all so different. For example, Jozs Bitelli and Rosanna Puyol’s piece was enacted on a Google Doc over the course of two months, whereas Octavia Bright and Carrie Plitt (who co-host the Literary Friction NTS podcast) recorded their conversation in one sitting. I’m biased, of course, but there is so much great stuff in this issue. Each contributor has such an individual style and infuses their topic or subject with a vivid energy. A lot of magazines and zines are using their platforms to push positivity, intersectionality, and progression out, but the darkness propagated by mainstream outlets feels ever-growing. Do you think we (as independent magazines) are having any impact? Philomena Epps: We are empowering individuals and collectives in authentic and important ways. Sick of being misrepresented, the forms of media that we align ourselves with are inviting people to speak for themselves, and offer perspectives not usually seen on a larger scale surrounding sexuality, race, gender, politics, and so on. I think one of the biggest media-related impacts that I’ve seen is the reciprocal relationship that these independent or small press (maga)zines have towards each other. It’s one of solidary and support, as opposed to competition. People collaborate and work together on DIY projects, contribute to each other’s publications, and attend, encourage, and celebrate each other’s pursuits, albeit new publications, events or exhibitions. The notion that you need ‘an angle’, or it’s a ‘crowded marketplace’ seems redundant to me and designed to try and create antagonism. The hostile reality of cut-throat competitive commercialism is being exposed and undermined. There is space for everyone. I don’t think you can have a true progressive feminism without questioning hegemony, which is founded on patriarchal and colonial values, particularly in relation to capitalism and labour. Unfortunately, and predictably, much of this impact is being immediately co-opted by the mainstream, which dilutes the message – so many brands are creating these crap pseudo-zines, and feminism is now an established buzzword used to shift overpriced razors. However, the rise of these positive and progressive magazines and platforms does mean that a community is being forged, and the power of the collective has always been a radical force for change. No movement happens overnight. We need to keep active, keep engaged, and keep talking. You mention in your editor's letter that you often feel like we are taking steps backward into a past era, and it's something I feel too. I feel like I've never been more progressive or open in my views, neither have those around me, yet the world feels so close-minded. Are we in a bubble? What impact do you want Orlando to have on the world outside of its pages? Philomena Epps: I want Orlando to be a place where people can find a liberated and expansive narrative. A polyphony of voices, of dialogue, of criticism. It’s important for me to feel like I’m creating an interdisciplinary and varied publication. Orlando is also an autonomous space. In some ways, picking the theme of discourse for this issue was also a way to re-establish and re-assert my editorial approach in the current climate. In terms of the bubble mentality, I think we need to keep communicating – not only just with those that agree or disagree with us, but also by listening to others within our own networks. There is a lot of insidious silencing of people happening within the left. As you mentioned before, the world has become a much darker place, so much has changed since I founded the platform at the end of 2014. Building a platform and a community has been an important way for me to interpret those changes, and galvanize a form of action and resistance. I’m a firm believer that the arts and humanities can have a significant stake in combatting prejudice and hatred. That said, how has Orlando evolved since Issue 0 and Issue 01? Philomena Epps: This is the biggest issue yet – it’s doubled in size! The format is also more homogenous and establishes a consistent blueprint for future issues. However, the content is perhaps more diverse – now introducing more substantial literary and film criticism, along with poetry, and artist pages dedicated to new, commissioned work. I reckon that one of the most significant shifts has been feeling more established and grounded. Orlando is here to stay. Issue 0 was ‘proto’ in style and subject, and Issue 01 – with its large format – continued this message of artistic experimentation. I’m still dedicated to change and evolution, it’s part of Orlando’s founding ethos, but I’ve felt myself drawn towards cultivating a publication that is perhaps more closely aligned to a journal, rather than a zine. My inspirations have always been, and still are, firmly rooted in multiple forms of self-publishing practices. 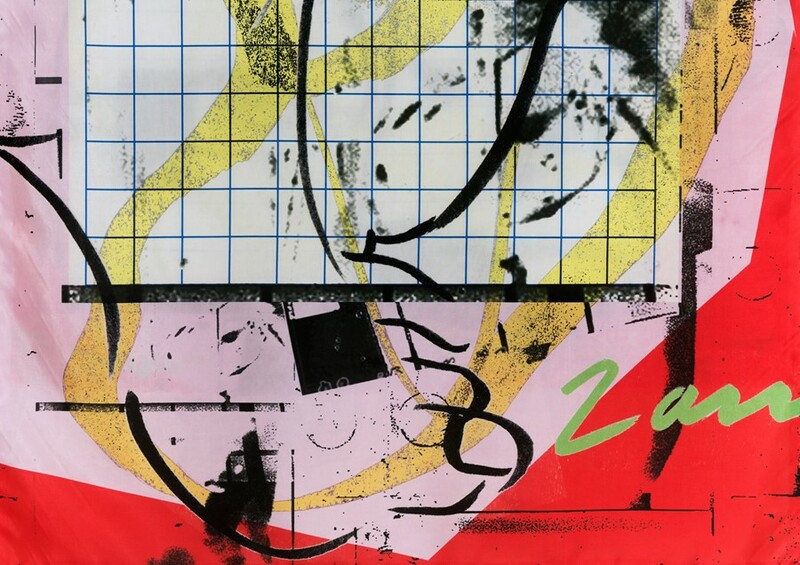 Zines are one of these formats, but I’m also inspired by radical ephemera, feminist journals, periodicals from the history of art and literary history, photo books, and artist publications. 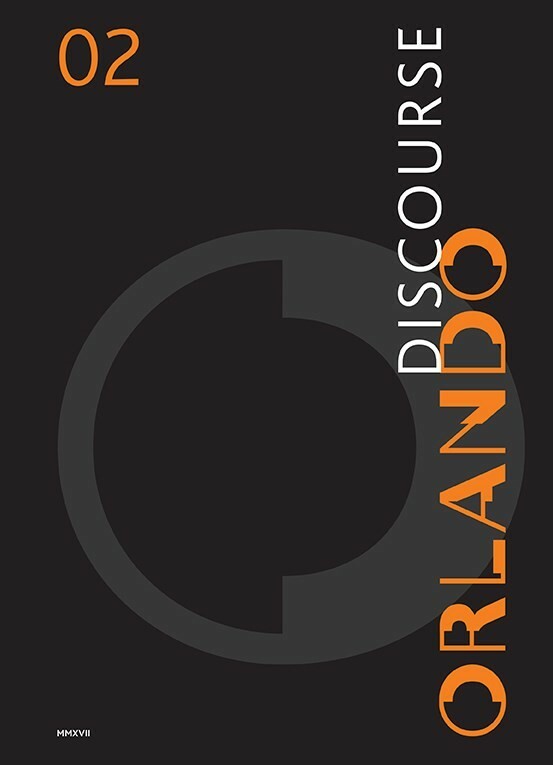 Orlando’s contributors are still resolutely passionate and provocative, advancing new ideas about the visual arts and it’s intersections with socio-politics and culture at large. Philomena Epps: I’m launching Issue 02 with an event and party at Bethnal Green Working Men’s Club tonight. Akin to the launches I ran for the previous issues, I wanted to bring the magazine off the page and into a public forum by inviting contributors to take part in a live event. Last year, I ran an evening of interventions and screenings. This time, in keeping with the notion of ‘discourse’, it will be an evening of poetry, performances, and readings. The line-up includes artist filmmaker Keira Greene, who will be performing with actress Sarah Mather; Hibaq Osman and Rachel Long from the Octavia Poetry Collective; Octavia Bright from Literary Friction; and a performance from the artist and poet Lily Ashley. Soon after that, I’ll be exhibiting at DIY Cultures, which is always an incredibly inspiring and exciting day! In terms of more long-term plans – I’m going to keep building up the online platform, and I’m looking forward to collaborating on a publication project and an exhibition / talks programme later this year. I was also recently invited to the Girls Heart Brussels weekend. Spending time abroad with the wonderful community that surrounds the Girls Like Us collective was really motivating, and I want to continue dedicating time to forging an international Orlando network. I always want to work with new people and welcome submissions or ideas for collaborations!